Will the United Workers Party (UWP) "put out" His Excellency President Charles Angelo Savarin from the State House if the party becomes the new government of Dominica? It looks so. UWP political leader Lennox Linton said today that "no President is going to live there under our watch." Linton told Matt Peltier's talk show on Q95, the Hot Seat: "One of the things that will happen when we come into office- you see that President's house there- I want the people of Dominica to listen to me carefully- what this Labour Party intends to be a palace for the President will become, will become the national centre for the creative arts in Dominica." 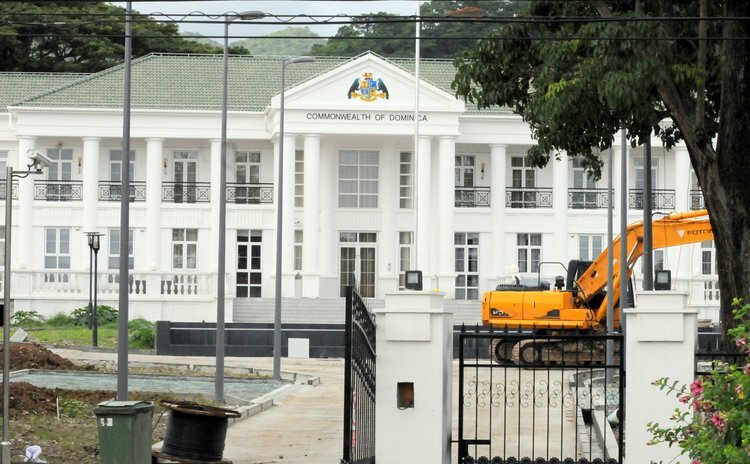 As the Sun reported earlier, the multi-million dollar state house, which was scheduled to be handed over to the government in August 2013, the administration announced in a press release on 13 June, remains a foundation of inflamed passion and naked contention. The emotions are as raw today as they were even before the project began over two years ago, the sentiments no less cemented. A pressure group, Citizens Awareness Programme (CAP), launched a campaign against the project, referring to it as the "State Malice" and "State Palace". Jerry Brisbane, the chairman of O.D. Brisbane and Sons, sought the European Union's intervention. "It is unfortunate that our government has seen it fit to place this loan for an unnecessary expenditure on the backs of its citizens especially at this time when there is such great requirement for basic needs. In light of your organization's reputation for ensuring the wise use of aid funds, I anticipate that the EU will be more vigilant in its lending requirements and ensure that any monies loaned to Dominica will be for projects that add value to the living standards for our citizens," he wrote in a letter dated 1 October 2010 to the head of delegation at the EU office in Barbados. Three weeks later, Brisbane wrote to the Chinese president expressing "my serious concern on the mishandling of funds generously donated to Dominica by your country." In the 13 June press release the government took a shot those who sought to wreck the project, stating that despite "a small, albeit vocal, opposition" the government remained committed to its completion, "emphasizing that the State House is not a luxury but rather a necessity." However, despite having all but lost the war against its construction, those opposed to it have refused to raise the white flag of surrender, choosing instead, a different line of attack. "It's such an anomaly. Frankly, it's a blight, not just on Skerrit but it's a blight on the whole leadership of the Caribbean," former minister Athie Martin told The Sun. No date has yet been set for the official opening of the complex, Colin McIntyre, who, in the absence of Julius Timothy was the minister responsible for the state house, told The Sun in an email exchange. However, he said, "it is safe to assume" that it will be soon after the handing over. The proposed tenants, including the president, the Electoral Commission, the Police Service Commission, and the Integrity in Public Office Commission, will move in "immediately after the entire complex has been handed over," McIntyre added. Dominicans have not been given reasons for the delay in handing over the building. But Linton suggested today that the payment of Value Added Taxes may be an issue between the government and the Chinese contractor.